What is wheel lateral stiffness? Lateral stiffness is how well a wheel resists flexing laterally (sideways) when a given load is applied in that direction. Stiffness is the ability to resist flex. A stiff wheel flexes very little. Mathematically, stiffness is the inverse of flexibility. It must be emphasized that wheel stiffness is not wheel strength, and in fact may be unrelated to it. I am measuring stiffness, not strength. X is the forward direction of travel when the rider rides the bike. Y is to the side: this is the direction of the load I applied and the deflections I measured. Z is elevation. You can see in this photo that the rider's weight on the left pedal causes a reaction force at the ground contact point with a component in the lateral or Y axis direction. This is the deflection I measured. How important is wheel stiffness? Plenty of parameters, for example those of aerodynamics and training, have a much larger bearing on bicycle performance than wheel stiffness. However, recently there has been debate about the lateral stiffness of bicycle wheels. The increasing popularity of Rolf wheels and the recent introduction of Shimano wheels has made people wonder whether low spoke count wheels can be stiff enough laterally. To rank the wheels according to their lateral stiffness. To answer some general theoretical questions about how wheels flex. A milling machine's table makes a very rigid base, so I machined aluminum blocks to hold the hub axle in the vise and quill of the mill (see Figure 1). I turned the blocks from an aluminum bar and bent a hook from a three-foot length of 5/16 inch diameter steel rod. I used the lathe and mill at San Diego State University's student projects lab. 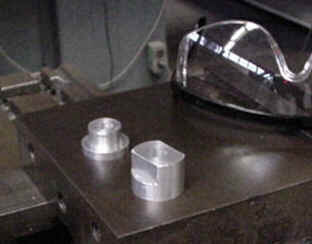 Machined aluminum blocks with through hole to receive axle. Using these blocks I mounted the wheel between the bed and quill of a milling machine. Method of holding wheel and measuring deflection at the rim. Hooked end of weight will be hung next to the dial indicator. Assign a wheel number, weigh, photograph and record description of wheel. Measure deflection several times in several places and record data. If bearing play is present, gently push rim to take up the slack before measuring deflection. Ship wheel back to the owner. Add data to this page. It is large enough to avoid some of the difficulty of measuring smaller deflections at lower loads. It is small enough not to damage any wheels. I have a convenient 25 pound weight that hangs nicely from a 0.78 pound rod ;-). The load is applied at the center of the rim's brake track, normal to the plane of the wheel. Deflection is measured at a spot within 3/8 of an inch (10 mm) of the point of load application, which I consider to be essentially at the point of load application. This 25.78 pound load did no damage to any wheel. Every wheel was perfectly rideable after testing. A 25.78 pound lateral load is almost certainly more than road bike wheels see in normal use. I chose 25.78 pounds because the deflection at a lower, more realistic load may be small enough that my measurement error of +/-0.002" (0.05mm) might become an inconveniently large fraction of the measured deflection. 1. Does stiffness vary with spoke tension? Some believe that a wheel built with tighter spokes is stiffer. It is not. Wheel stiffness does not vary significantly with spoke tension unless a spoke becomes totally slack. 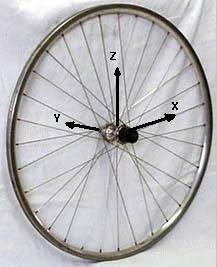 I measured the deflection of Wheel #2 while gradually loosening the spokes in quarter turn increments. The wheel did not display any significant change in stiffness until the spokes were so loose some became totally slack. If the spokes are so loose that some become slack, the wheel becomes much more flexible. The last two data points below, 9 and 10, taken when the spokes were so loose the wheel was almost sloppy, show that the wheel becomes significantly more flexible when spokes on the detensioning side of the wheel actually become slack. That is expected: a slack spoke cannot add stiffness to the wheel; it buckles easily in compression. A wheel whose spokes become slack while riding is a weak wheel, because slack spokes cannot support the rim. This can be avoided to a large extent by building wheels with tighter spokes. If spokes are tighter initially, then the sudden increase in flexibility shown in data points 9 and 10 is less likely to occur in use because a tighter wheel can bear a higher load before spokes become slack. Wheel #2, MA2 32-spoke front. 2. Are front wheels stiffer than similar rear wheels, and if so by how much? Most front wheels are stiffer than similar rear wheels. Structurally, this is because front hub flanges are typically wider than rear hub flanges. Rear hub-flange spacing is constrained by industry-standard dimensions, such as cassette width, dropout spacing and symmetrical frames. Most rear wheels I tested are between 40 and 60% more flexible than similar front wheels. Although it may be the case that stiffer front wheels have been developed intentionally for more stable handling, it is possible that many front wheels are simply overbuilt or many rear wheels are underbuilt. Track wheels are an exception: rear hub flanges are often much wider than fronts, and therefore such wheels are slightly stiffer laterally than similar front wheels. Compare track wheels number 83 and 84 (below) for an example. Besides flange spacing, the other parameters that could affect stiffness are often held constant between front and rear wheel pairs: number and gauge of spokes, and rim cross section. However, it is becoming more common to see wheel pairs sold with a different number of spokes in the front and rear wheels. [That is true of modern high-performance wheels, but also whas true of the Britich standard over several decased -- 32 front, 40 rear -- John Allen] On the other hand it is still the rare wheel pair that is sold with different rims front and rear. Specialized Composite wheels. Since these wheels are the same except for hub guts, they do not differ significantly between front and rear wheels. In fact the front can be used as a rear by changing the axle. Velomax Javelin. The rear wheel is slightly stiffer than the front wheel (8%). Structurally this may be because of two design features: the narrow front hub flange spacing decreases the bracing angle on this wheel compared to more typical front hubs with wider spacing, and the higher spoke count in the rear wheel compared to the front (24 spokes in the rear versus 18 in the front) adds stiffness to the rear wheel to more nearly match the front. Spinergy Rev-X. The RevXs I measured showed a large range of deflections from the four spots around the wheel: +/- 0.010" to 0.016" out of about 0.150", (0.25mm to 0.41mm out of about 3.81mm) or 11%. For this pair of Spinergys (wheels 56 and 57), the front is about 12% to 16% more flexible than the rear. There is no dimensional explanation for this (flange spacing and other dimensions are the same), so I attribute the difference to variation in manufacturing from wheel to wheel. The next pair might have the front/rear relationship reversed. Aerospoke. Like the Specialized, these wheels are the same except for hub guts. Consequently, they do not differ significantly between front and rear wheels. 3. Do dished wheels flex differently from one side to the other? Dished wheels do not flex significantly differently to the left or right. A dished wheel might deflect slightly more due to loads applied from the flatter side than it does due to equivalent loads applied from the other, but it is unclear from this data whether this is really the case. It may be true in theory, because of the difference in bracing angle between the right-side spokes and the left-side spokes: the more favorable bracing angle of the left-side spokes may be better able to restrain the rim against deflection to the right than the right-side spokes might brace the rim against deflection to the left. If it exists, the difference is very small: on the order of just a few thousandths of an inch, i.e. within the error of my measurement, even under the larger-than-life load of 25.78 pounds that I used for this test. Even if a small difference exists in this artificially high-load case, no one will notice the even smaller difference the wheel might display while riding. Range of deflections due to loads applied from the right-hand side (indicated by the RH after the wheel name). The average of all four (or more) measurements is near the middle of each vertical range line. The slanted line between each range connects the average deflection of the left and right sides. The fact that this line is slanted upward toward the right in every case shows that, on average, rear wheels may flex more in response to loads from the right side than to loads from the left. However, the range of measurements (length of vertical lines) shows that the difference between left and right is often smaller than the measurement error or the range of response of one side of the wheel. 4. How does the shape of the wheel change in response to a lateral load? This question comes up because some people worry about the rim rubbing the brakes while climbing. There is no doubt rims rub sometimes on MTBs, because occasionally you can hear the brake shoes rub. But the wheel is not the only thing flexing: frames and forks flex, too. In describing how the rim flexes at points far away from the point of load application, Jobst Brandt describes a saddle or taco shape . I measured and found this to be accurate. Let the point of load application be called 0 degrees. Then the two other locations I measured would be called 90 degrees away and 180 degrees away, i.e., one quarter and one half way around the wheel away from the point of load application. To form a saddle shape, when a load is applied at 0 degrees in the positive direction, the deflection at +/-90 degrees should be in the negative direction, and the deflection at 180 degrees should begin to return in a relatively more positive direction again. This is exactly what happened. The chart below shows the (exaggerated) shape of several rims when loaded as described above. The zero-deflection base line is horizontal, and the various colored plots of the different wheels show the lateral deflections measured at 0, 90 and 180 degrees. The load is applied at 0 degrees, at the left end of the horizontal axis. The deflections measured at 0, 90 and 180 degrees show that the wheels assume the expected arching or saddle shape. At 180 degrees, even though the rim is headed in the positive direction, it does not often cross back over to the positive side of the zero-deflection base line. Most bikes have their rim brakes between 90 and 180 degrees . The deflection here is fairly consistent among all the wheels, and did not vary significantly between the stiffer and more flexible wheels. For this 25-pound load, all wheels flexed about 0.020 inches or half a millimeter in this region. This flex is in the direction opposite the load. This is the same direction the frame is likely to flex under a lateral load at the tire contact patch, such as occurs when climbing out of the saddle or sprinting. The brake and wheel will move in the same direction, thus reducing the relative motion between the rim and brake that may cause the brake to rub. Some wheels pair the spokes together at the rim, so there are large spans of unsupported rim between spoke pairs. Does this make the wheel flex differently? The usual worry is that the rim will be more flexible in the long unsupported span. I compared deflection measured when the wheel was loaded at pairs of spokes to deflection measured when the wheel was loaded between pairs of spokes. So far, I have measured five wheels built with some kind of paired spoking. There is no significant difference in the flexibility of these wheels anywhere around the rim, either at spoke pairs or between them. The results are mixed, but generally paired spoking for any given wire-spoked wheel does not lead to a significant increase in flexibility between the spoke pairs compared to flexibility at the spoke pairs. Such wheels have about the same stiffness at spoke pairs as between spoke pairs. In fact, the Shimano wheels are actually slightly stiffer between spokes than they are at spokes, but again this difference is insignificant. In contrast, the multi-spoke composite wheels showed a marked difference in stiffness between spokes compared to the stiffness when loaded at the spokes, with a few exceptions. Zipp 3000 135% Largest difference in this test. Specialized front 700C clincher 57% Taller rim and wider spokes make an improvement in this design. 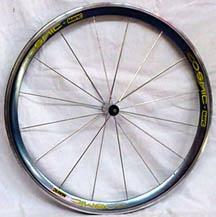 Spinergy RevX, new style 49% Four spoke pairs shorten the length of unsupported rim. Corima 4-spoke 23% Four wide spokes shorten the length of unsupported rim even more. Aerospoke 5-spoke 0% These wheels are the most flexible wheels I've ever tested. There is no difference at or between spokes primarily because they are so flexible everywhere. Spinergy RevX, old style -17% Yes, these wheels are actually stiffer between spokes. But this is only because the spokes are so loose that the bottom-side spoke becomes slack at a very low load. When loaded between spokes, the rim is stiff enough to recruit two pairs of spokes and make the underside spokes go slack on both pairs. The wheel is stiffer in this case because slackening occurs at a higher load. For example, the Specialized wheel is over 50% more flexible when the load is between spokes than when the load is at a spoke. In spite of this large difference, many people ride Specialized composite wheels with great success, although there have been reports of disconcerting handling when they are used in track sprinting or all-round riding on steeper tracks. 6. Do Shimano's laterally crossed spokes make the wheel laterally stiff? The Shimano WH7700 (Dura-Ace) wheels have a number of fairly unusual features, one of which is a spoking arrangement in which the spokes originating at one side of the hub attach to the rim on the other side. Shimano claims "...the wheel's lateral rigidity is significantly increased...", and maybe it is compared to a similarly light 16 spoke wheel without the lateral crossover. But it's still a pretty flexible wheel. The most similar wheels in this test are the Mavic Cosmics. Even though the Cosmics are heavier, they serve as a fairly good comparison since, like the Shimanos, the Cosmics have a fairly deep rim and 16 spokes. The significant differences between the Cosmics and the Shimanos are wider hub flanges and a slightly larger rim cross section on the Cosmic, both of which add stiffness as well as weight. more details Shimano WH-7700 16-spoke front. 2.6 x 1.4 mm elliptical spokes. more details Shimano WH-7700 16-spoke rear. 2.6 x 1.4 mm elliptical spokes. 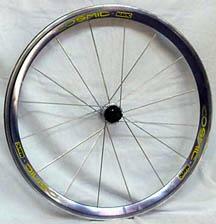 big picture Mavic Cosmic 16-spoke tubular front. 2.8 x 1.4 mm elliptical spokes. big picture Mavic Cosmic 16-spoke tubular rear. 2.8 x 1.4 mm elliptical spokes. 7. How does spoke gauge affect stiffness? Thicker spokes make a wheel stiffer, if all else is equal. A typical 32-spoke wheel built with 2.0mm spokes is about 11% stiffer than a similar wheel built with 2.0-1.45mm swaged spokes. Compare the deflection of two wheels: numbers 39 and 47. Wheel 39 is built with 2.0 1.45mm swaged spokes, but wheel 47 is built with 2.0mm straight-gauge spokes. Hub dimensions are effectively identical, spoke count is the same and the rims are the same make and model, so the only structural difference is the spoke gauge. Result? The wheel with thinner spokes deflected 0.051" (1.30mm) in font and 0.067" (1.70mm) in the rear, but the wheel with thicker spokes deflected less: only 0.046" (1.17mm) and 0.055" (1.40mm) for front and rear, respectively. That's an 11% increase in stiffness for the thicker-spoked wheels. 8. Does having a tire inflated matter? 9. Does stiffness vary with spoke cross? I need more wheels to measure the effect of spoke pattern. If you have a wheel similar to one that's already listed, but with different pattern, please send it to me. E-mail ﻿ . 10. Are radial wheels stiffer elbows in or out? How much? Because the bracing angle is increased, radial wheels are about 13% stiffer elbows out, all else equal. Todd Kuzma sent me a wheel built elbows in, and after measuring lateral stiffness I rebuilt it elbows out. The wheel's deflection was 0.050" (1.27mm) with elbows in and 0.044" (1.12mm) with elbows out, for a difference of 0.006" (0.15mm) more flexible in the elbows-in configuration, all else equal. Wheel #95 is an example of a wheel built with spoke elbows out. Wheel #5 is an example of a wheel built with spoke elbows in. In the table of results, the two wheels I compared are #94 with elbows in, and #95 with elbows out. 11. Is there an optimum left-flange location? For highest lateral stiffenss, wider flange spacing is always better. Front hubs already have nearly the widest flange spacing that will fit in the fork, but rear hubs have room to widen flange spacing by moving the left flange outboard. But as always there is a tradeoff. The farther the flange moves, the looser the spokes. Loose spokes make for a weaker wheel. 12. How do 650c wheels compare to 700c? Smaller wheels are stiffer than larger wheels. If they are built on the same hubs, then the bracing angle is larger for smaller rims. If everything else is the same, 650C wheels are about 25% stiffer than 700C wheels. Note: smaller wheels often have fewer spokes than larger wheels, and this is as it should be. For similar strength, spoke spacing at the rim is what should be held constant, not spoke count. Consequently, a 650C wheel with 28 spokes is about the same strength as a 700C wheel with 32. This is the case with the wheels I measured to identify this 25% difference in stiffness: wheels 69 and 71. 13. Are newer Spinergy RevXs stiffer than the old ones? While spoke tension normally does not have a significant effect on wheel stiffness (See question number 1 above), this is only the case as long as no spokes become slack. That is one reason high initial spoke tension is important. 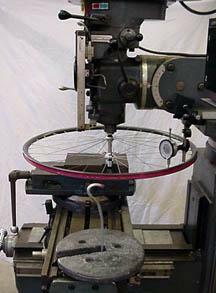 In comparing old versus new Spinergies, the initial tension was low enough in the older Spinergies that spokes did become slack, making the older wheels more flexible as a result. 14. Is the Spinergy RevX SuperStiff stiffer than a regular Spinergy RevX ? Yes, the SuperStiff I measured deflected only 3/4 as much as the regular model (0.046" (1.17mm) for the SuperStiff compared to 0.059" (1.50mm) for the regular model). The Super Stiff is about 25% stiffer than a regular RevX. Both of these are quite new (Serial 301526 for the regular RevX and 357185 for the SuperStiff). 15. Do Spinergy X-Beams make a measurable difference? Nope. The difference is smaller than the precision of the measurement. Strangely enough, the RevX I measured was actually more flexible after I installed the X-Beams, though the difference is insignificant (0.059" or 1.50mm of deflection with the X-Beams compared to 0.057" or 1.45mm without). 16. How does rim weight affect stiffness? For rims of similar design, the heavier rim makes a wheel stiffer. 17. Is deflection linear with load? 18. How does lateral tire flex compare? 19. Does tying and soldering affect stiffness? Data table: data.htm. Compare these results with François Grignon's research. Does wheel stiffness even matter? This test measures lateral stiffness alone. It does not include the radial load all wheels see in use. It does not measure radial stiffness, nor strength of any kind. Is it possible for wheels to be too stiff? Is it possible for wheels to be too too flexible? 1. Brandt, Jobst, The Bicycle Wheel, Avocet Press, Palo Alto, California, 1995. 2. Brandt, Jobst, "Tied and Soldered Wheels", rec.bicycles. * newsgroup FAQ. 3. Smith, Jeff, Re: Spoke tension and stiffness?, rec.bicycles.tech newsgroup message, November 07, 1999. 4. Grignon, François, Aero Wheels Under Scrutiny, Club Cycliste Beaconsfield Cycling Club, 1998. Rob Bernhard, Jobst Brandt, Vic Copeland, François Grignon, Todd Holland, Eric Hollenbeck, Brad Hunter, Jon Isaacs, Todd Kuzma, Darryl Mataya, Barney Milner, Hank Montrose, Chuck Davis, Dan Rock, Charles O'Toole, Jane Rinard, Ken Robb, Russell Seaton and Shaun Wallace.